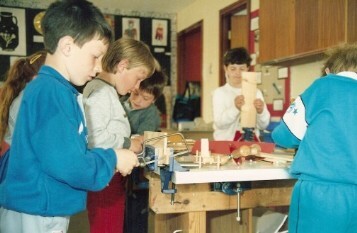 In the 1980's the nature of the Secondary School Curriculum changed from the traditional subjects of Woodwork, Metalwork, Technical Drawing, Home Economics and Needlecraft to what became known as Craft Design and technology, and brought with it sufficient credos and influence that it became acceptable as an "A" level subject for University entrance. 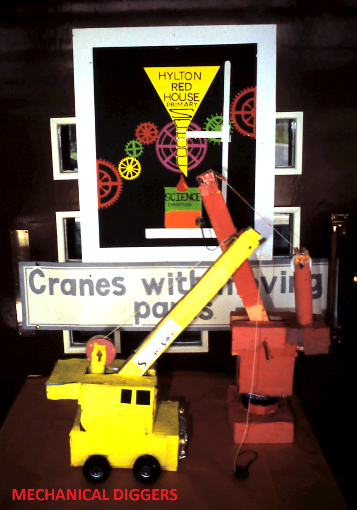 Later in the 1990's the Design Council made proposals to have Design and Technology related activities included in the Primary School Curriculum, as a way of providing opportunities for links across the subject boundaries though a problem solving approach. 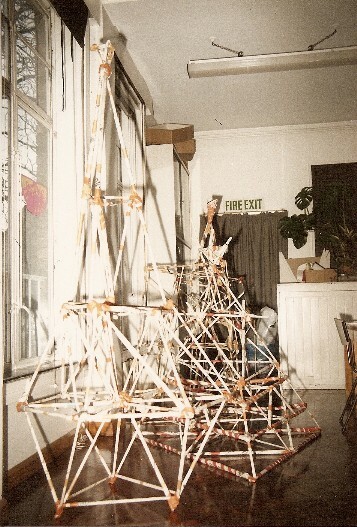 Historically at Primary level children have always been involved in practical activities, except that the teacher normally did the designing, and pupils did the making in what might best be described as "practically focussed tasks". 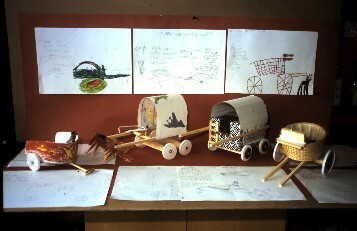 In this way the pupils gained an understanding of the materials and also developed a range of simple skills. The argument was "How can you design before you fully understand the material properties and manufacturing process". Young children are inquisitive, eager for new, relevant experiences, and in adulthood will be required to think for themselves to solve everyday problems that they may encounter. The first thing to realise is that there are numerous examples of Art, Craft, Science and Technology work that teachers of Key Stages 1 and 2 have always been concerned with that can form a basis for their confidence. But all teachers will need to acquire some practical knowledge and organisational competence in order to organise Design and Technology activities in their classrooms. It is important to note that Design and Technology should evolve from "good primary practice", not as a diluted form of practical activities offered at Key Stage 3, and must be manageable for the "generalist" teacher, whatever his or her background may be. So schools need to build on their teachers' existing strengths and weaknesses rather than impose radical new schemes that no one supports or understands. 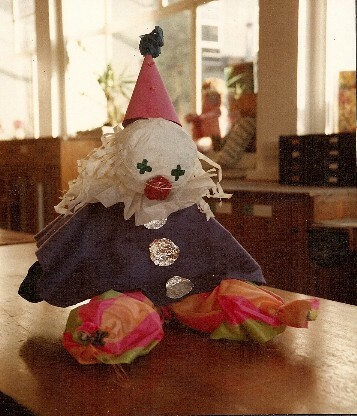 In Art based activities examples of Rod and Stick, Shadow, Paper Plate, Glove puppets etc could provide opportunities with a practical element involving making a simple puppet or using a range of materials such as card tubes, fabrics, yarns, and household disposable items. 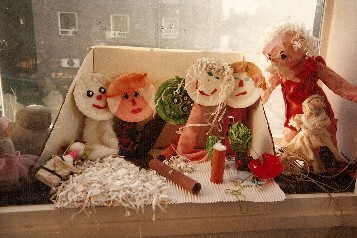 The puppets may then provide a way of linking with language, developing children's confidence by acting out stories they have written and simple theatrical situations. 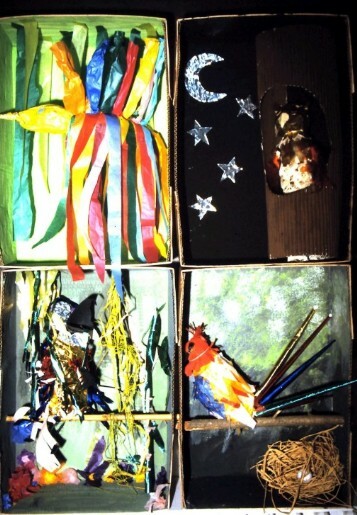 "Creature Boxes" introduce the topic of different environments that animals and humans live in. Another Art activity could start with an examination of various cultures such as the Egyptians, Aztecs or Greeks or the general context of "Celebrations" where the practical outcome may involve the manufacture of various masks, helmets or headdresses and costumes. Here there is a natural link with drama, history and geography. Young children can also be involved in examining the Role of the Artist in Designing and Making a range of products that use media and materials to communicate information. Posters, Cartoon Strips, Packaging, Carrier Bags, Paper Hats and Visual Identity Products that on a simpler scale can provide a range of Design and Make tasks for young pupils in the Primary School. At one end of the spectrum a reception class teacher may give pupils paper plates and dowel rods and children can design the faces of their puppets using collage, paint or crayons. In Y6 a more complex project may require to teacher to have more subject specific language and knowledge of electricity with simple motors, batteries, switches, pulleys and wires to help pupils motorise their buggies, fairground rides or add lights to their lighthouses. Progression is all important, building on children's knowledge from earlier classes, and if teachers move up the school they will often be learning alongside their pupils, and acting as a consultant, guide, or mentor, rather than being experts with an unlimited bank of knowledge at their disposal. The class teacher can provide children with a "Magical Mystery Tour", with Design activities flowing naturally across the Curriculum, and providing links with Art, Language, Science and Mathematics, but there are new areas they may be unfamiliar with. With the older pupils there may be times when practical sessions are required to demonstrate safety aspects of a range of tools and equipment, such as junior hacksaw, screwdrivers, wheel braces etc. This will give pupils hands-on practical experience thereby becoming familiar with the safe use of hand tools, most of which they could find in their home environment. 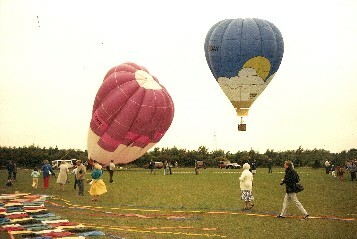 In Science based Designing and Making the teacher could provide a range of tasks within the context of Wind Energy, Seed dispersal, Parachutes, Windmills, Wind Direction and Speed Indicators, Gliders, Hot Air Balloons, Mobiles, and Kites. Some elements of the work could also examine a range of structures, towers, bridges, cranes, mineshafts, oilrig platforms, houses and homes, human skeletons where simple structures are evident. The practical component here could involve designing and making a structure using paper straws, card, rolled paper, and other simple readily available materials, and exploring the man-made environment. Included in the main pages of the website is a selection of original photographs of examples of Design Technology that are representative of work by Key Stage 1 and 2 children in local North East Primary Schools that were recorded in Hartlepool, Sunderland, Durham County and Cleveland. They include Art and Science based Design Technology themes and projects from Primary Schools that were identified as having "good curriculum practice" by Subject Advisers in those Local Education Authorities. It would be impossible to thank and name all of the pupils, teachers and schools involved, but in particular I wish to thank Clavering Primary School in Hartlepool for assisting with several projects. Without the co-operation of the late Ray Russell, headmaster, and three of his class teachers, Ron Vickers, Reeda Dobson and Valerie Neale, and of course the pupils, the work would never have been completed. Despite the fact that most of the photographs used on the website were taken several years ago, and that the nature of the original "National Curriculum" Design Technology Guidance for work in Primary Schools has changed dramatically in the last few years, I believe that the information and examples given on the website are still relevant as guidance for teachers of Key Stage 1 and 2 students. I would also like to point out that the pupils shown in the activities will now be aged 25 to 30 with children of their own. The website is a collection of material that has been assembled from original work completed during the author's time at Durham University. The site is still under development and if practising teachers have examples of recent Design and Technology projects with photographic images, it may be possible to include their pupil's work in the website. John Rennison was born in Willington, a mining village in County Durham, where both his father and grandfather worked at Brancepeth Colliery. Influenced by his woodwork teacher at Crook Alderman Cape School, he followed a five year course in Furniture and Industrial Design, but was never tempted to go into industry. Instead he has spent forty years in teaching, holding various appointments at Peterlee Grammar Technical School, Hartlepool Art College, Hild - Bede Teacher Training College before finally retiring from Durham University School of Education, as Lecturer in Art and Design Technology on Undergraduate and Post Graduate courses. Originally his appointment in 1976 involved Craft Design and Technology Studies at Secondary Key Stage 3 level but from 1990 to 2008 he specialised in Key Stage 1 and 2 and during that period his work involved covering the Primary Art and Design Technology Foundation courses for the Bachelor of Arts (Education) Initial Teacher Training Degrees and Primary Post Graduate Certificate Students. He spent a research year teaching in Clavering Primary School, in Hartlepool, and was involved in numerous Curriculum Development "Baker" days for Primary School staff in Durham, Cleveland and Gateshead in co-operation with the Design Technology Advisers for those Education Authorities. Married with 3 children and 7 grandchildren, he is now fully retired catching up on unfinished projects, and exploring his family ancestry.